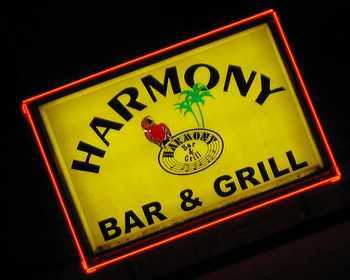 The Harmony Bar is everything you need. Fresh made Pizza during the week M-F, grill open till 11:45 every night(till 8:45 on band nights) Yes, you can have your burger or beef chili or chicken or tuna everyday, AND veggie options like walnut burger and Portabello sandwich, salads, are great. Homemade potato chips and soups. And the music!!!! best in national and local blues, alt. country, jazz, bluegrass, funk, etc.